Waking up on my second day in Sydney, I still was definitely feeling my chest cold. My magical Benadryl had helped me through the night, but made me too drowsy to take during the day. So I went for the next best thing. 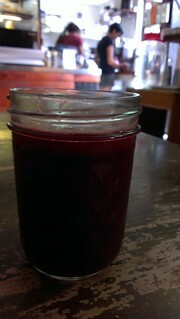 Another super gingery juice from Sadhana Kitchen, made by the lovely Sophie. After getting ginger powered, I strolled down King Street and made my way towards Apt. I had been looking forward to going to Apt for a very long time, I used to go to Naked Espresso and I was excited to see what the new venture was like! I met up with Elizabeth for brunch. I love chai, and must try it in all its forms. 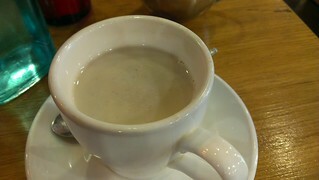 A steaming hot chai was a nice follow on to my ginger juice. Generally speaking I prefer savoury breakfast foods (though pancakes are forever), so I chose the omelette. There were three choices of filling, and I think I had pumpkin and spinach. 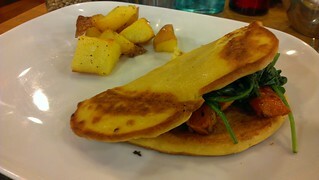 Unfortunately they were out of potato rosti, but it did come with some lovely roasted potatoes. 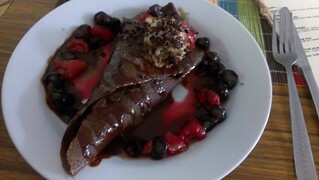 This was very yummy! 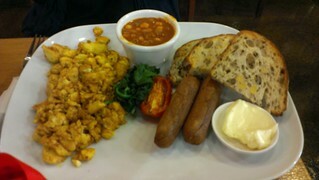 Elizabeth got a make-your-own breakfast plate - scrambled tofu, spinach, tomato, beans, sausages and toast. 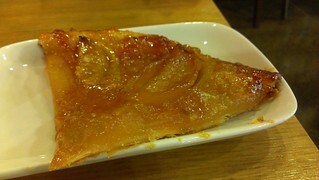 We finished off with a piece of apple galette, which was just perfect. Afterwards, I took a long stroll down King Street, stopping in at many of my old favourite places. Unfortunately I was starting to feel pretty crappy from my chest, but it was a nice day so a gentle stroll was welcome. I had hoped to go and have a late lunch at Great Aunty Three, which has vegan Bánh mì, but unfortunately when I got there they only had vegan prawn left, and I cannot stand vegan prawns or shrimp. Next time. Instead I walked up toSpoon's Vegetarian Butcher. I had a Polenta Sausage Roll. By this stage I was feeling pretty crappy, so I can't really give this a proper rating as I wasn't really tasting much of anything and then my stomach started to burn. When illness gets in the way of my holiday eating, I get a serious sad face. I headed back to Leigh's place and had a nap with Lucie and re-read Divergent on my Kindle. After a short nap I was feeling like maybe I could attempt something else. 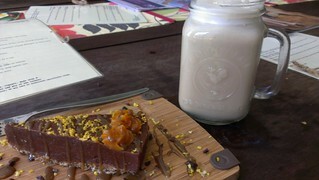 So I went back to Sadhana Kitchen for an almond milk chai and a piece of Jaffa Cake. I was very happy to find raw cakes that were not packed full of coconut oil, because coconut oil and Susan are unmixy things at the best of times. This was just perfect. After some further napping and reading, Leigh came home and we made dinner plans. Thai Pothong is a really well-known Thai restaurant in Newtown, and I was super happy when Leigh told me they have a vegan menu! 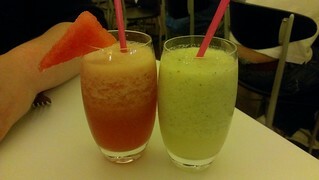 We started with some mocktails. I can't remember what was in them! Tamarind Tofu. 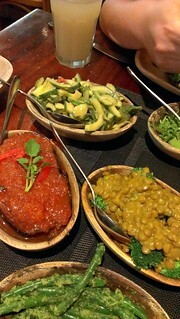 This was one of my favourites, I love anything tamarind! 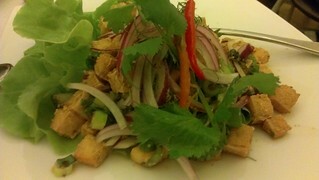 Spicy Tofu Salad. 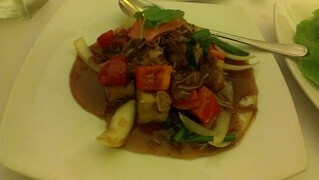 I really liked the tofu, it had great flavour. 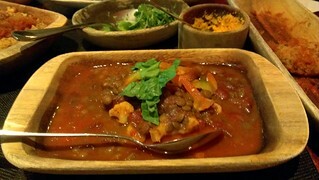 I was a bit wary of the spicy part, because I don't like things too hot, but it actually had barely any heat. 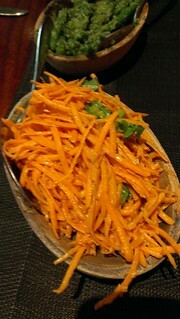 I can't remember exactly what this is, but I think it was a stir-fried pumpkin dish. It was yummy. 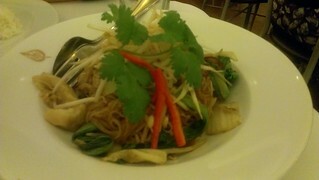 Yummy Pad Thai. Not as good as The Green Palace Pad Thai, however. 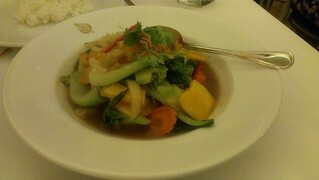 Sadly, there was no vegan Pad See Ew on the menu. Mock Duck. 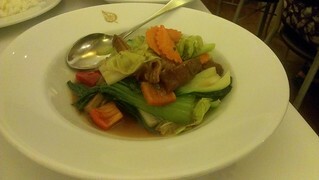 This was not my favourite, I found the mock duck very fatty and oily. We finished up with some more gelato. 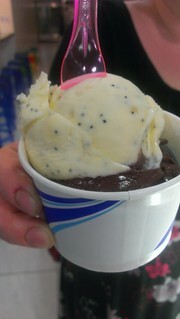 This time I had chocolate and orange-poppy seed. Like a jaffa! The following morning, Leigh very kindly made me breakfast. She also made me some toastie cheese sandwiches to take on the plane! 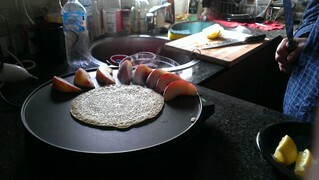 Breakfast was crepes with sugar, lemon and grilled nectarines. So delicious! After this, I packed up my bags and we headed off back to Spoon's, where we had an early lunch and I also picked up some of their goodies to bring home. 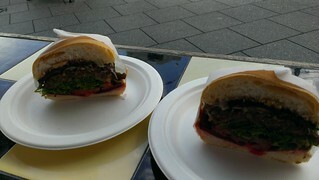 We shared a Butcher's Burger with all the extras (mushrooms, cheese, beetroot and pineapple), which I really enjoyed. We also shared a small serve of Tofu Nuggets. These were great. 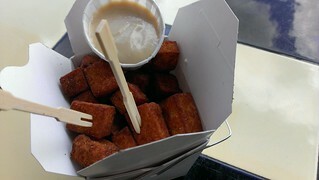 Seasoned fried tofu chunks with a creamy dipping sauce. Then it was in a taxi and on my way to the airport. I was flying with Qantas (I usually fly Virgin) and although I hadn't specifically requested it, I was given a vegan sandwich. It was awful. Oily eggplant and vinegary sundried tomatoes on crappy bread. Toasted cheese sandwiches were so much better! I loved my brief Sydney adventure, and it reminded me that two years is really too long to stay away from Sydney. So hopefully I will be back in October, with many more food adventures to come! 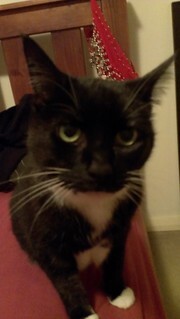 This is Squeak, Leigh's second cat. Consider yourself judged. Judged by a cutie! Hello again! And back to Sydney. It has been a really long time since I have blogged, and an even longer time since I have blogged regularly. However, I've been feeling the blogging urge of late. So hello again! Since I spoke to you last, I have been working (of course), went to Japan (which was awesome) and have started a new vegan venture, called Eating For Animals. My little Sahara has been having some health issues, she was diagnosed with quite severe IBD at the end of last year, and we are still trying to get the right combination of meds and diet to control it. She had to have patella surgery several weeks ago as well, and had to be cage rested for a month and also had a giant bandage on her leg! She is sweet and brave. Dim Sim has been good. I have also been working away at my masters and also testing for my friend's new vegan cookbook, which is going to be an amazing book! Anyway, on to some fun times and food! In January I was a bridesmaid, which meant I got to spend a weekend in Sydney. It was in fact my first weekend in Sydney in almost two years! Insane. The wedding was on a Friday, so I got to spend the rest of the weekend in Sydney, nomming it up. I stayed with the delightful Leigh, who was an excellent host and happens to live in an extremely convenient location! I was staying insanely close to Sadhana Kitchen, so I headed there for breakfast. I was really excited about trying the Banana Coconut Pancakes - Sprouted buckwheat and coconut pancakes served with superfood caramel sauce and fresh banana. 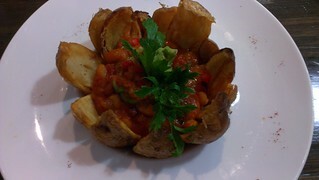 It was amazing, so delicious. It is like magic how these are raw. 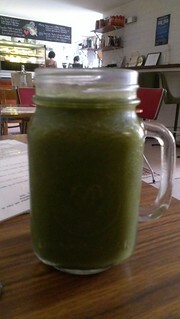 I also had the Daily Green Smoothie - Seasonal greens, cos lettuce, celery, banana, mango, apple. I had been battling a head cold for a few days that was moving down into my chest, so I also requested a super ginger juice. 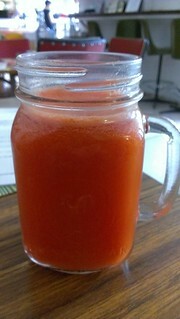 I think it had carrots and orange in it as well as ginger. It burnt my throat all the way down, the very best! But the best thing about Sadhana was the lovely Sophie who was working there. Was lovely to see her. 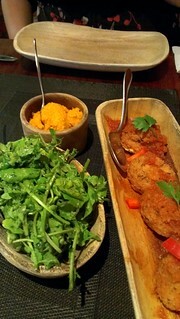 :) I then caught a bus to Surry Hills to meet up with Mandee and Michelle for lunch. Just as I arrived it started absolutely bucketing down with rain. There were no tables inside, so we ended up waiting for sometime with out umbrellas in the rain until there was space. I was pretty soaked through! I had been looking forward to trying the potato nachos, and they did not disappoint! Michelle also had the nachos. 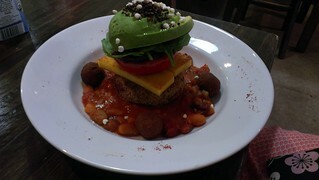 Mandee had the Vegan Stack. Looks yum! After carbing it up, Michelle and I went for a stroll down into the city and found a Daiso store - this is a Japanese chain or super cheap things. I will elaborate more when I post about my Japan trip, but it was so exciting to see it. It has awesome stuff. After saying goodbye to Michelle at the train station, I walked back up to Surry Hills to go to The Original California Burrito Company, as I had heard they had vegan cheese and sour cream for their burritos. 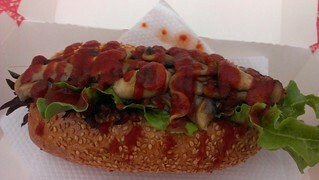 I had one with rice, veggies and spinach. 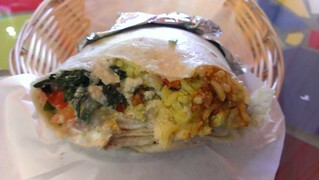 It was fun having the vegan sour cream, but I wasn't particularly blown away by the burrito itself. I then started the walk of all walks, walking down Cleveland, then cutting across to Broadway, before walking up Glebe Point Rd to visit the new location of The Cruelty Free Shop. I stocked up on my favourite chocolate chips (Tropical Source) and also tried some new yummy Nakd bars and a raw chocolate that was really yummy. I then walked back, through Sydney Uni and down King Street. 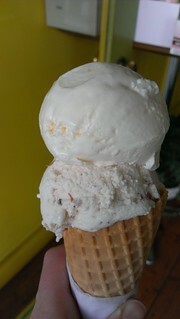 I stopped at Vegan's Choice and got an ice cream cone - one scoop coconut and one scoop rose vanilla. 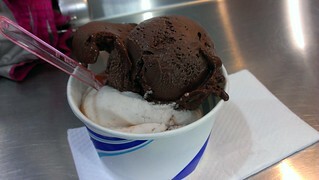 The coconut ice cream here used to be my favourite ever. But the flavour is not what it was. 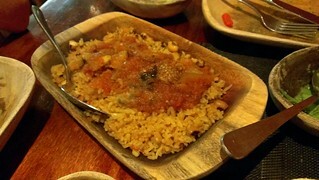 I met up with Leigh to go to dinner with her and J at an African place on Enmore Road. 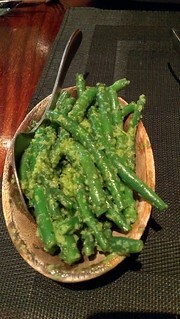 What followed was an amazing feast of fresh vegetables, beans and rice. I don't remember what everything is called, so just look at pretty pictures. I could not forget to include a kitty! This is Lucie, one of Leigh's lovely ladies. 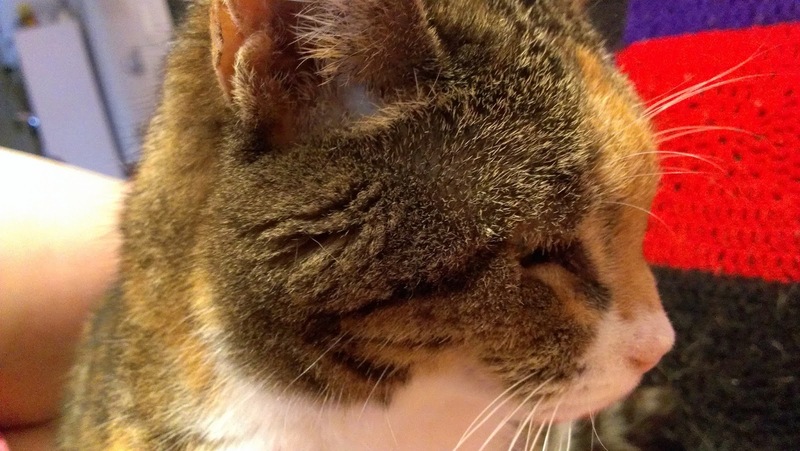 Lucie is a super senior kitty. She slept on the sofa next to my air mattress and supervised my sleeping.